An alien spaceship has crash landed in the world of Arcadia! Expand your Boss Monster game with this mini-expansion for 5-6 players. 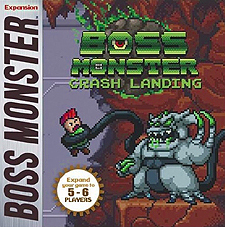 Crash Landing introduces an all new treasure type, new heroes, new Bosses, and new rooms powered by alien monsters and technological traps never before seen in the world of Boss Monster. Contains 45 all new cards.